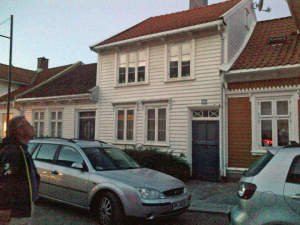 Today I sent the following email to a newly found DNA cousin match at ancestry whose great-grandmother lived right next door to my family in Kristiansand, Norway in the late 1800s. She moved to the U.S.A just a year after they did (1884 and 1885) and lived a block away from where my grandad eventually lived on Ovington Ave in Brooklyn, N.Y.
OK now I REALLY want to see where our DNA matches, because I have a large database (spreadsheets) of where my Dad, my brother and I match various known Norwegian relatives so it is likely that I can figure out from the matching DNA segment(s) where we are related and if it is really the 7th cousin match shown at Ancestry.com on the Eigeland line. Pretty please either upload to GEDmatch or Family Tree DNA or both. This raw data consists of thousands of lines of information and it is best to use special tools to look at it. You can of course look at it in a spreadsheet where you would see over 70,000 lines that look like the image on the left. 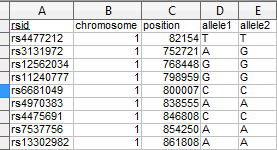 The columns are the rsid number (a reference SNP cluster id), the chromosome, the location on that chromosome, and what the two base pairs there are. Note that when it says T it is actually a paired AT and when it says C it actually a CG pair. Since these are always paired the listing only shows one of them. Hi, I have a somewhat similar message that I send although I also tell them how it will benefit them. I explain that testers from all 3 major testing agencies can also upload there and therefore they will get more matches, and their heritage reports are more detailed so you can also find more about that. Worth it. I had also hoped to do something similar, in reverse. I hoped I could get my ‘A-kit’ GEDmatches, find those people on Ancestry, and use the new Shared Match tool to suggest some family links. I can find them, but none of them have Shared Matches. Many are MUCH further down in the rankings on Ancestry than on GEDmatch due to Ancestry’s algorithms. Which makes me wish Ancestry had a chromosome browser!! Interesting idea Rich to do it in reverse. When I see a new match at GEDmatch that is an A kit I have occasionally tried to find them on ancestry. I will let you know how I do with sending the link to this post! I cannot find a way or place on FTDNA to upload my DNA . Can you help please? Oops. Think I found it but do I have to pay to use it after I upload my DNA? I see that I shall have to polish up my invite quite a bit. Thank you Kitty for another excellent blog. And thank you Rick for sharing your Ancestry experience. I am not quite so disheartened any more – particularly where a match is of critical importance to me in breaking down a brick wall but not necessarily important to the match. Does anyone know of a quick way to check several checkboxes in Gedmatch (column 4) at once? I am trying to upload my information to Genome Mate and to go through and check 1000 boxes or more, one at a time, is very tiring. I have tried adding on Checkbox checker extensions in Chrome & Firefox but I can’t seem to get them to work on Gedmatch. Thank you. Pat, I use the checker extension. You have to highlight the whole table down to all the matches you want to include (because if you select too many matches it won’t run). Then right click anywhere to get the dialog box and select to check. I hope this helps you. Congratulations, cousin! You have provided lots of helpful info to us all. Maury said you and I share genes. I have a kit here too, m416219 I think is the number. Have you heard of wikitree.org I have many ancestors profiles there. That site also has options to upload gene files for comparison to other members though I have not used that feature yet. I have been thinking that Maury and I (probably you too) are connected through the Lewis name but am not sure yet because I have been thus far unable to trace that name past Robert Lewis possibly born circa mid 1800s, really have no idea when though; husband of Bythie Moran probably born around the same time. The latest version, V4, of the ancestryDNA test is not currently accepted by FTDNA. They could not give me a timeframe. I received the results of my Ancestry DNA test and instead of clearing up a few things it confused me even more. About 1/4 of the matches are on my mom’s side, 1/4 on my dad’s. The remaining half (About 800 people, at this point) are more closely related than anyone on my mom’s or dad’s sides, but not one person in our family trees matches up. Some people have as many as 75,000 people in their trees! Could uploading my DNA info to GedMatch or FamilyTree possibly help me find out how I’m related to these people? Uploading might help but takes a bit of expertise (think learning curve) to use. Perhaps first look Michele’s tips to help determine whether one of your grandads was not your grandad. That many unrelated close relative is suggestive of that. Then if you want to find out more, do some uploading.